DMV.com was created to help simplify your life by providing you with all the vehicle related information and Michigan DMV services you may need, in one place. Quickly find information and services regarding driving records, vehicle registration, drivers license renewal, license plate renewal, getting a learners permit, and finding a Michigan Department of Motor Vehicles approved traffic school. Discover MI driver license services including SOS license renewal. MI residents must have a drivers license from the SOS to drive legally. Order your Michigan DMV driving record quickly and conveniently. Requesting MI driving records online is the easiest way to get them. The Michigan DMV requires auto insurance for all drivers. Find low cost auto insurance rates today at our MI online car insurance center. Taking MI traffic school online may allow drivers to reduce insurance premiums or dismiss tickets. Learn about MI traffic school benefits. Take an MI DMV practice test online to gauge your driving knowledge. A DMV practice exam will help you to pass the written drivers test. Take a Michigan drivers education course online. The MI SOS requires MI drivers ed for license applicants younger than 18. A DMV bill of sale records a transfer of vehicle ownership after a car purchase. Learn how to request a bill of sale from the Michigan DMV. Learn how to pay a ticket online in Michigan quickly and conveniently. Failing to pay traffic tickets in MI can earn a driver DMV penalties. Learn about the Michigan DWI consequences enforced by the SOS. A first DWI in MI results in fines, license suspension and other penalties. Buying a car online in Michigan makes it easier to complete SOS new vehicle registration. Buy a car in MI the convenient way. Find a nearby DMV office in Michigan where you can obtain DMV services. MI DMV locations are conveniently located throughout the state. Cut out SoS’s bureaucracy. DMV.com has easy guides for drivers license, vehicle registration, license plate, emissions and other motor vehicle issues online. Want to deal with your DMV issues fast and simple, right? There is a way. We present you our guide to the Michigan Secretary of State. 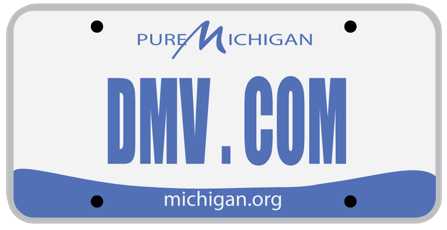 Want to obtain a driver’s license or maybe to renew your vehicle registration and get insurance for your ride – don’t worry, we have everything covered on our Michigan DMV.com website. There will be no more wasting precious time. Navigating through our site won’t be a problem at all. Use the search bar or the navigation sections below. All articles include detailed info on the step-by-step processes you must complete in order to deal with your Michigan licensing and registration issues. There are also articles about state’s requirements for boat and motorcycle registration and licensing. Be part of our website. Give us feedback, comment our articles, like us on Facebook and share your thoughts and experience with other users. That will help us be always up-to-date when it comes to providing the exact info you need. This is a privately owned website, not affiliated with any government agencies, and has only one purpose – to help people save time when dealing with driver’s licenses, registrations, auto insurance and all related issues.